Specialised equipment can be hired at very competitive prices. Centrally located in historic Parktown, the PEMBI EES-SIYAKHA Conference Centre is close to the Johannesburg, Rosebank and Sandton Central Business Districts, a convenient distance from OR Tambo International Airport and less than five minutes from the M1 Highway. 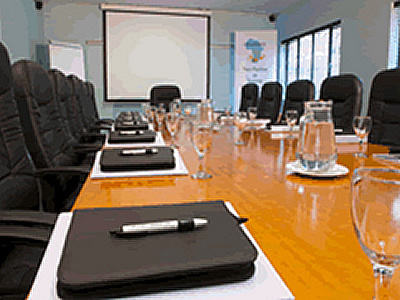 The PEMBI EES-SIYAKHA Conference Centre offers you a choice of three upmarket, well-equipped, air-conditioned conference rooms and a selection of competitively priced conference packages. If booked in advance, we cater for all special dietary requirements. Stay left and take the St Andrews Rd offramp. At the top of the bridge, turn right into St Andrews Rd. At the first traffic light, turn right into Jan Smuts Ave. Follow Jan Smuts Ave. At the first traffic light, turn right into Sherborne Rd. The EES-SIYAKHA Conference Centre is on your left. Travel down Jan Smuts Ave towards Braamfontein and the City. Pass The Valley Rd and Eton Rd, and at the traffic light turn left into Sherborne Rd. The EES-SIYAKHA Conference Centre is on your left. Pass the Smit St offramp and the Empire Rd offramp – keep left. Take the Jan Smuts Ave offramp on the left. At the top of the bridge, take the slip road on the left into Jan Smuts Ave. Move over to the right hand lane. At the first traffic light, turn right into Sherborne Rd. The EES-SIYAKHA Conference Centre is on your left. Take the St Andrews Rd offramp. At the top of the bridge, turn right into St Andrews Rd. At the first traffic light, turn right into Jan Smuts Ave. Follow Jan Smuts Ave. Keep right. At the first traffic light, turn right into Sherborne Rd. The EES-SIYAKHA Conference Centre is on your left.